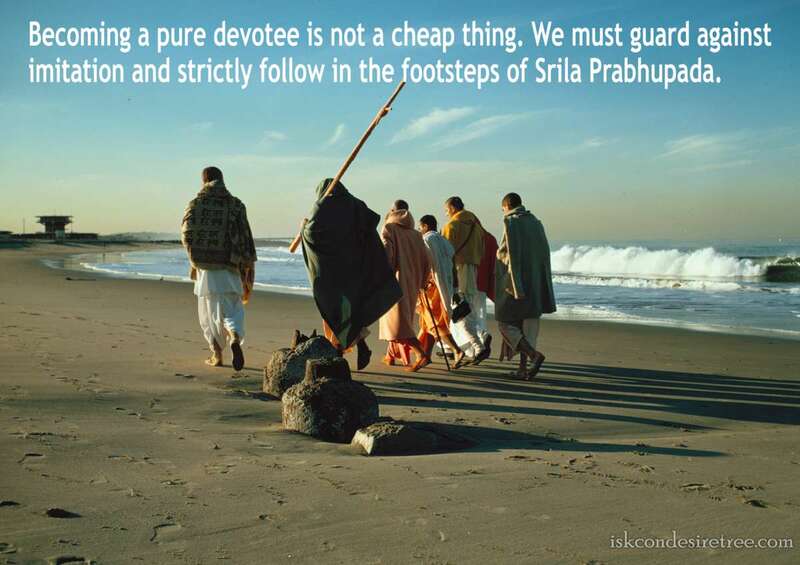 Becoming a pure devotee is not a cheap thing. We must guard against imitation and strictly follow in the footsteps of Srila Prabhupada. Who Becomes A Pure Devotee of The Lord? One who is in knowledge of the Absolute Truth and free from all material desires becomes a pure devotee of the Lord. Always remember Krishna who is your dear most friend and always serve Him just to please Him and He will give you all intelligence how to be a first class devotee. Without becoming a devotee of the Lord, one cannot perfect one's human life. The perfection of human life is to be elevated to the spiritual world, where there is no birth, no death, no disease and no old age. Without this aim, any amount of material advancement in so-called comforts can only bring the defeat of the human form of life. Any jiva, in any form of life, in the form of a Bird or Animal, or in the form of a Human, can become a Devotee.